To paraphrase Garrison Keillor, it has been a quiet weekend in the Evansville Community Theatre. The second rehearsal was last Thursday (rehearsals pick up again tomorrow), no set work was done, just a quiet Memorial Day weekend to take one long, last deep breath before the mayhem resumes and we go headlong at it again. One of the suggestions, when starting a blog, is to go out and look at other similar blogs. What I found in this research, besides the idea to add “Showtimes” to the right column, was that, as far as I can tell, ECT is somewhat unique. It appears that many community theaters seem to have a few paid staff to raise funds, schedule seasons, and promote the shows. I guess it’s deceiving though, since I’m aware of several area community theater groups that, like ECT, are all volunteer operations. Sound crew does pre-show test during Oklahoma! costume rentals, props we can’t find, replacement lights, gels, batteries for microphone packs, programs, advertising…the list continues. The checking account dives perilously. And we hope we have a show people want to see because butts in seats means bucks in the bank which means we get to do it all again. We obviously don’t do it for the money, we do it because we love what happens when the curtain opens and the audience applauds. We provide an opportunity for the actors to display their talents and the backstage crew to partake in a hobby they love. 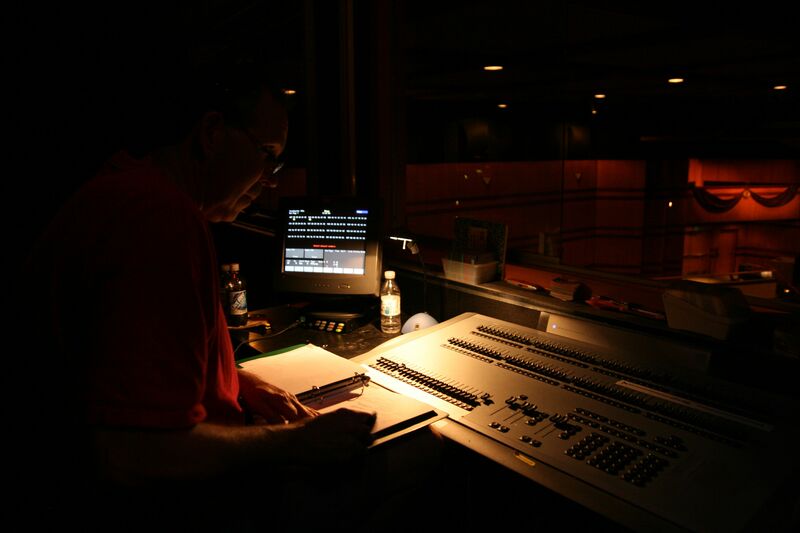 We have several people backstage that, at one time in their lives, got paid to do the technical work they now do for free. We appreciate the countless hours of time donated, which is what makes all of this magic happen. What it takes--the cast, crew, and pit band from ECT's 2010 production of Oklahoma! Of course we require the money that the ticket sales provide. If we break even, it’s a good thing, If we can make some extra that’s an even better thing. Last year, we spent a good chunk of change replacing the light rigging in the Middle School Auditorium. The light bars over the stage were held up with ancient hemp rope, an accident waiting to happen. We hired a company to come in and remove the rope, replace the pipe, hang it with heavy duty chain, and rehook the electrical. It’s an improvement most people won’t notice. That’s where the money goes when a show does well. It benefits not only ECT, but also the School District that uses the auditorium for a number of events. Of course, ECT, like many other groups in town, looks for donations from individuals and area businesses. We already need to thank Walter Shannon Law Office which has generously offered to be a major contributor to Fiddler on the Roof. We know we aren’t the only deserving group in town and realize there are a limited number of businesses constantly being asked to support everything from the Scouts, to the High Mileage Vehicle Club, to the High School Pom Squad, to the Music Boosters, to the Evansville Community Partnership, and on and on. We truly appreciate their generosity. 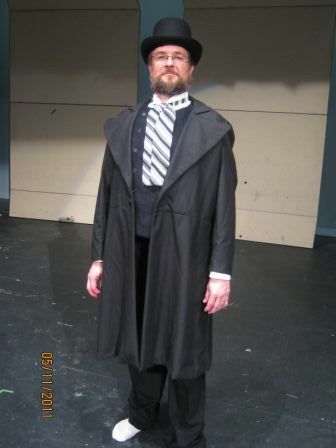 The first ECT production that I was involved in was The Music Man in 2003 when I helped out with set construction. From what I can tell, it was the first major musical that ECT had produced. It was truly a community effort. We got a grant from the Wisconsin Arts Board that allowed us to hire a director from Madison. After that it was all volunteers. More than 100 people auditioned and when the director was trying to make cuts, the stage manager, a local person, told him, “you have to cast them all.” I guess he was taken aback, but cast them all he did. And when the curtain opened on River City, Iowa and nearly all of them were on stage, we all realized what a small determined group could do. Fiddler on the Roof will be the fifth musical and our third in as many summers. I suspect that when the curtain opens on Anatevka it will be no less awe inspiring than when it opened on River City eight years ago. 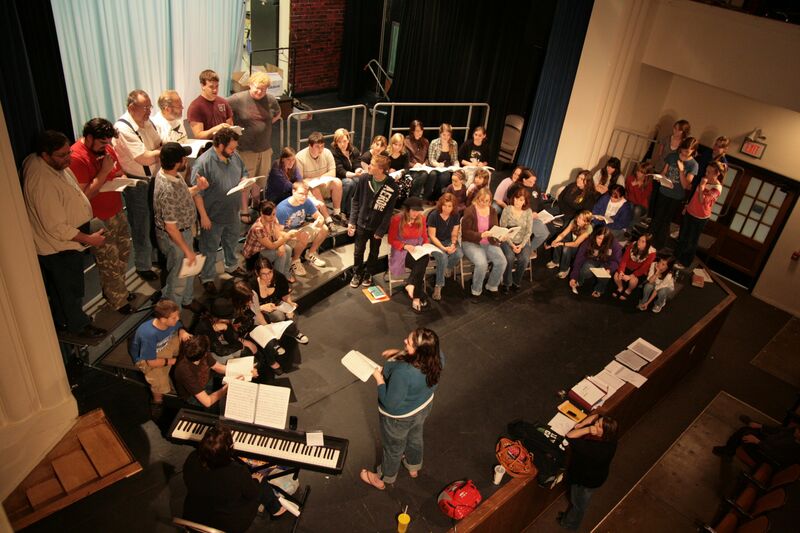 When I first walked into the auditorium on Thursday evening, the cast was singing Tradition. Considering that this was the second music rehearsal, it sounded great. As soon as the song was over the cast would burst into instant chatter and conversation, much to the chagrin of Liz Utzin who was leading. She did her best to quell the chatter so she could talk but it seemed that once the singing was done the chatter would begin. The chaos that would ensue between songs is representative of all aspects of the production during the first week. Christa had four versions of the cast list in front of her and was making more changes on the fly. Some of the cast had to drop out due to other conflicts which led to rearranging the cast, moving somebody from one role to another or an ensemble person into a bigger role. And then there was the re-sorting of the girls who offered to play male roles, and adding a few people that had shown up during Tuesday and Thursday who would like to be part of the chorus. The as-close-as-possible-to-the-final cast list might be set again but that’s still subject to change. Backstage, Melissa was collating various parts of the scripts for those people who don’t need the full book. Seven of those, ten of these, how come there’s an extra of this? Scott was there early during the rehearsal with the list of work crews for the set pieces. Captains and crews for each piece have been named. Since there aren’t scheduled rehearsals on Wednesday evenings it becomes a time available for the crews to work on their pieces. All this organization and reorganization is against a backdrop of all the regular activities that people are involved especially during the end of the school year. Soccer, baseball, softball, awards nights, band concerts all swirl in the background as the school year winds down. And, of course, we need to have another production meeting. Over the weekend I was asked numerous times if I had seen the cast list for Fiddler on the Roof. I replied “no.” Christa Stowers, the director, explained she had a hard time making a lot of the final decisions. Call backs were pushed back a couple of days and she spent the weekend on the phone finalizing the cast. Producer Dave Sobeski looks over the possibilities at call backs. Director Christa Stowers and Tom Beaver discuss the fine points. Actors come in all stripes, some come in wanting one role and one role only, others just want an opportunity to sing in the ensemble. Yet others need a role big enough to justify the time and travel commitment. In all 66 people were cast. They arrived in the Middle School auditorium Monday evening to get their scripts. Even then there was some reworking of the cast. One who auditioned and received a role had a chance to go to Africa which conflicted with the performances so another was moved into that role which set off a chain reaction of moves and left one open part to be determined. And finally the initial read through. Out in the hall costume measuring commenced. Over at the High School shop they had added a roof to Tevye’s house, one strong enough for a Fiddler to stand on. Nine weeks and 29 scheduled rehearsal days stand between Monday’s read through and opening night. And with that the chaos begins. At 12:30 this afternoon, Sunday May 22, a troupe of ECT actors will present Talking Spirits in Evansville’s Maple Hill Cemetery. 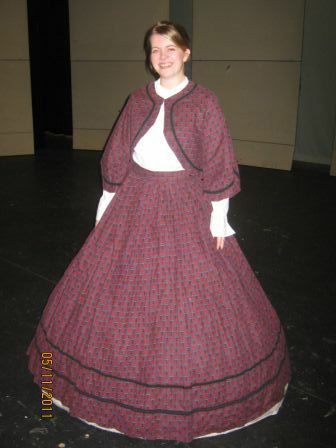 The actors will present biographical vignettes of Evansville soldiers and their families. During Thursday evening’s run through of Talking Spirits, there was a long discussion between the coordinators about a fall back location should the weather forecast hold true. At that time the weekend forecast was for overcast skies and thundershowers so there was concern both about attendance and the welfare of the rented costumes. As it turns out the skies are crystal clear and the breeze will keep the actors, as well as the attendees, comfortable during the 1-1/2 hour performance. Jim Brooks did most of the writing with help from Melissa Schnepper and John Decker. Jim stood at the base of the stage Thursday and listened as the actors, who were still relying a bit on their scripts, worked through finding their characters. Jim has obviously invested a lot of time and effort into the research of each of the historical figures presented at the performance and gave the actors more background to help them out. The scripts are a distillation of the characters’ personalities as well as the influence of how the Civil War was weighing on them. All of that squeezed into dialogues that are limited to 8 minutes. The concept of presenting something like this seems easy enough—find some actors, dress them up, write a few paragraphs, find a few props—no big deal. No sets, no sound, no lights, no technical folks. And yet, Jim spent hours researching and writing, Melissa scrambled finding actors and costumes, the actors spent hours learning their scripts, and there were still some missing props on Thursday, not to mention what to do in case of bad weather. At 2:30 today the whole thing will be over and many of those involved will quickly recalibrate and prepare for Monday evening’s first read through of Fiddler on the Roof. Everyone who brought Talking Spirits to life deserves a big round of applause and should take a moment to revel in the accomplishment. But not too long, Fiddler starts tomorrow! On the ECT Facebook page somebody asked how many people auditioned for Fiddler on the Roof and the answer is 70. It was a great turnout. So great, in fact, that Director Christa Stowers pushed callbacks from Tuesday to Thursday to give her more time to consider the possibilities. On Saturday and Monday, the J.C. McKenna cafeteria was the waiting room as people waited patiently for their turn to audition. Over the course of the day 40 people showed up so there was plenty of time to think. I was trying to get a sense of what people were feeling while they waitied–some looked tense, others chatted or laughed, some sat in one place while others walked around. I’ve never even considered auditioning for a musical so I really have no idea what it would be like. Director Christa Stowers and Stage Manager Melissa Schnepper listen. Well, I do, I guess. I remember when I was in 6th grade, I was pulled out of class and led to the music room where our music teacher handed me the words to a song we had been singing in class and asked me to sing it. There were two other teachers in the room to listen along. She played, I, overwhelmed by nerves, did my best to sing. If it had been like American Idol, and the group would have then given me feedback, I would have been told I was “pitchy and out of key.” It was all I could do to keep from fainting. I did get a role however. I got to turn pages for the pianist during the play, The Sound of Music. I did fool Julie Hutchinson, our Music Director, on Saturday, when I ran some paperwork into the auditorium between auditions. She exclaimed, “are you auditioning?” So I gave her a few bars of The Sound of Music as I dropped off the paperwork. I generally don’t sing in public, which I’m sure people are grateful for. If I had thought about it, for even a moment, I wouldn’t have been able to actually do it. So, while I was sitting in the cafeteria, I was trying to figure out how people deal with musical auditions. Are they nervous, tense, indifferent, or confident? I watched and wondered, and from what little of the auditions I heard I realized that once Julie played the first few notes on the piano whatever they felt during their wait disappeared and the songs came out beautifully. Fiddler on the Roof set construction continues Saturday, May 21, in the morning from 8 until 12 at the Evansville High School PAC shop. Most of the work will involve framing more of the set pieces. Never tried set construction before? Stop by and see how it’s done and you can try your hand at it. A lot of Saturday’s work will involve driving screws into 2 x 4’s with power drills as well as cutting on the power saws. Don’t worry, though, we don’t want you doing anything you’re uncomfortable with so if a saw isn’t your thing, we’ll keep you busy with other parts of the project. If you are interested in helping out, stop by and we’ll put you to work. This work isn’t suitable for kids so, please, don’t bring them along. Safer work for the younger set will come later. We’re always looking for donations of building materials–everything from dimensional lumber to sheeting (plywod), styrofoam, etc., as well as fabrics, paints, nails, screws, tools, etc. Have extra materials laying around? Here’s an opportunity to get them out of the garage and donate them to a good cause! Stop by on Saturday morning and see what we’re up to! The shop entrance is on the back of the school across from the baseball field by the large dock door. There is still one more audition date for ECT’s production of Fiddler on the Roof, Monday, May 16 at 6:30 at the J.C. McKenna School in Evansville. Don’t hesitate to drop by. While we had a good turnout on Saturday, we know there is still a lot of talent out there we haven’t heard from! Helpful audition information is at the ECT website. The first day of preparation on Saturday was taking place on two fronts. At 7:45 a.m., a load of lumber had been delivered to the High School shop. I had a few minutes so I inventoried the stack—ten 2 x 4’s, ten 1 x 4’s, five sheets of styrofoam, two sheets of plywood and ten pounds of drywall screws. This picture doesn’t have much merit from a critical photographic standpoint, but a pile of lumber just isn’t very photogenic. Then I ran over to the Middle School to help set up for auditions and returned to the High School at 10:30 a.m. What I found was amazing. Master Carpenter Bob Jackson, Set Designer Scott Brummond, and two volunteers, Monica and Leota, had transformed the lumber into the framework for Tevye’s house. For this production, those who are cast will be responsible for helping out with set pieces so Tevye and his family will be responsible for painting and “dressing” the piece. This was Scott’s idea with the hope that this will give the characters a sense of ownership as they make these pieces their own. Set Designer Scott Brummond reports: Set construction fun starts at 8:00 am in the Evansville High School Performing Arts Center shop. We’ll start with Tevye’s house and work from there. Come on by before you audition and get rid of the nervous, pre-audition jitters. Call it audition therapy. We’re there till noon. If you want to get involved come over to EHS Saturday morning. The shop is in the back of the school of off West Fair Street by the baseball field. Come join the fun! Auditions will be held at the JC McKenna Middle School 307 South 1st Street, starting at 10. You can find a map and helpful audition information, sample readings, character descriptions, and and other information at the ECT website. Click on the Fiddler poster to get to the audition page. Summer has been making a cameo this week, with temperatures in the 80s for the last couple of days, which seems appropriate for an event called “The Heat is On,” Evansville Community Partnership’s annual chili cook off. Normally, it’s held in March but is making its May appearance due to the opening of the new Creekside Place Community Center. The event raises money for the Partnership, which is then used for a variety of projects around town. The Partnership is also responsible for the Rally ‘Round the Flag Civil War event. At this point you’re probably expecting me to tell you that ECT participates in the chili cook off by dressing up as jalapeno peppers and handing out flyers. And to that I would tell you, you’re half right. We do hand out flyers. Heather and Dave, along with 22 other entries, will be cooking all day to make sure they have the best chili available. It’s going to be a bit tricky for Dave since he’ll also be at Fiddler auditions all day. You’ve been warned, should you decide to try Dave’s chili. It’s almost upon us again. Saturday will be the start of a slippery slope that will consume us through July. Aspiring amateur actors wanting to be a part of Fiddler on the Roof will arrive at JC McKenna Middle School and lumber will arrive at the back door of the Evansville High School theater shop. The production team had its last pre-production meeting this evening, with a discussion that consisted mostly of questions. What positions still need to be filled? What forms need to be copied for Saturday’s auditions? What time are auditions? Are you sure? What shape will the auditorium be in? Is the high school ready? When will the rehearsals move to the high school? How will we handle the dream scene? Oh! Does anybody know an accordion player? Sadly, the number of answers falls well short of the number of questions. As the train starts in motion, many of the answers will appear and many of the questions will be forgotten. And as our set designer, Scott Brummond pointed out, “before you know it we’ll be drinking beer at the post-strike picnic.” At that point whatever questions aren’t answered won’t matter. The important issue now is that auditions are Saturday from 10 to 12 and 1 to 3 (sorry we have to feed the volunteers at some point or they get crabby). If you can’t make it then a second opportunity is Monday from 6:30 to 8:30 pm. You can find a map and helpful audition information, sample readings, character descriptions, and and other information at the ECT website. Click on the Fiddler poster to get to the audition page. And if, like me, you either can’t sing or don’t want to be on stage, then there are plenty of opportunities to use your other talents sewing, painting, pounding nails or helping bring the models pictured below to life. We really need your skills so come join us!